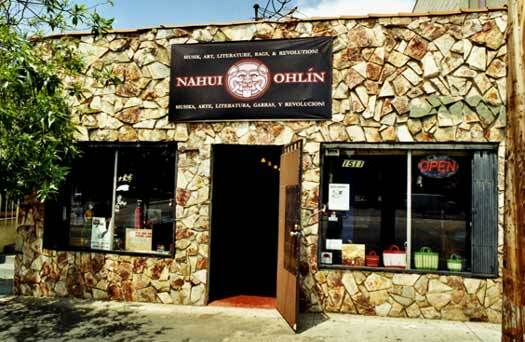 Our store�s name is "Nahui Ohlin" which in nahuatl means: Four Movement. We decided to call it this because we felt we had to represent our ancestral wisdom and history. You see, four is a sacred number which in itself expresses movement. The four Directions, Four Elements, Four Major nations on this continent, The Inka, Maya, Mexikah, and Kahokia. There are also four seasons, and four stages of human life: Infant, adolescent, adult, and elder. All part of movement. And this store and idea, is the re-birth of an Indigenous movement. We try to cover the different perspectives of our culture. We have Northern Indigenous literature, and history. Also crafts from Mexikoh, which represent the day of the Dead. We have Alpaka hats from Ecuador, and our most popular item: T-shirts. Revolutionary, Indigenous, Traditional, Political, Payasadas, and just plain garras Firmes. We have underground Hip Hop, musica folclorica, Musica de protesta, and Speeches by Messengers of Justice. Books of Revolutionary movements in Centro America, and Mexikoh. Jewelry, incense, old Rustic images of Tonantzin, and hand made hand bags. We even have "Mexican Lucha Libre" masks. We decided to open up a shop in Echo Park because of the lack of cultural representation in this part of the city. In fact, we felt like after the "Chavez Ravine" incident in the late 50's la raza in this area has been kept silenced and passive. Hardly anyone knows that the team they support and defend out at the stadium, forcibly evicted Mexicanos out of their homes to make way for progress. The Dodger clan is now trying to heal those wounds by exhibiting Raza on their billboards as cheering fans. Reflecting us as passive supporters of "La Dodgerization". We defiantly reject the Gentrification that is also taking place here in Echo Park. La Raza, once again is being displaced and ejected out of Echo Park. History repeats itself. But, nosotros on the other hand are counterattacking it. We "Degentrificate" by moving in. We are here to represent la Raza and our grandiose Cultura. 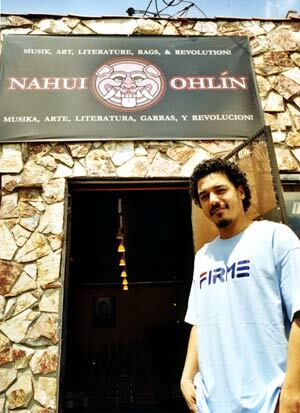 Clothing Lines: Firme Clothing, Industrias Ilegales, Anahuak Designs, Orale Wear, Resist and Insurgentes.